The nearest airports are Albany International Airport and Syracuse Hancock Airport. Travelers flying into these airports are responsible for arranging transportation to Jordanville. The nearest Amtrak train station is in Utica. Taxi fare from Utica to Jordanville is approximately $50. An Adirondack Trailways bus stops in Richfield Springs, a short cab ride from Jordanville. The nearest Greyhound terminal is in Utica. THRUWAY - Exit 30 (Herkimer). Route 28 (South). Continue on Route 28, turn left at Jordanville Road. 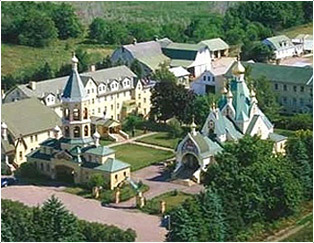 The Monastery is about a mile past Jordanville, to the left side of Route 167. ROUTE 20 - To Richfield Springs, then Route 167 (North) at Richfield Springs. The Monastery is about a mile past Jordanville. From Richfield Springs take HW 167 north towards Jordanville. Drive through Jordanville following HW 167. Stay on HW 167 as it leaves Jordanville. At the first curve after Jordanville, keep left so you stay on HW 167, and a few miles later you will see the monastery ahead. Don't follow the road as it curves right, but as you approach the monastery turn off the road to the left (thus going straight into the monastery). Parking will be on your right. Using New York Thruway (I 90) take exit 30, for Mohawk. Turn south on HW 28 and drive through Mohawk. Follow HW 28 out of the town and proceed straight uphill. If it's winter, HW 28 will be cleaned regularly, so keep going past Dennison Corners and after a few more miles there will be a sign for Jordanville at the blinking yellow light. Turn left on Jordanville Road and drive on it into Jordanville. Go straight at the stop sign and you will be on HW 167. At the first curve after Jordanville, keep left so you stay on HW 167, and a few miles later you will see the monastery ahead. Don't follow the road as it curves right, but as you approach the monastery turn off the road to the left (thus going straight into the monastery). Parking will be on your right. Note: Robinson Road is now open.